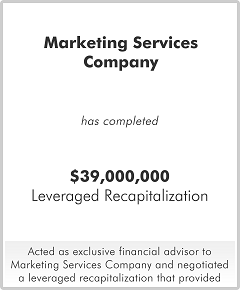 Marketing Services Company is one of the leading providers of a specific product that acts both as an investment and a collectible in the United States.The company's shareholder had been in the business for 50 years and was considering a shareholder liquidity eventTo maximize value, M&A Capital recommended a parallel process that considered various structures, including a sale of all of the shares and a leveraged recapitalization including management participation. A sale to strategic buyers was considered; however, the shareholder recognized continued growth opportunities and the leveraged recapitalization allowed the shareholder a second bite at the apple through holding a material minority interest of the company's equity. Virtually all the proceeds from the leveraged recapitalization were used to pay a significant dividend to the shareholder. The transaction was financed through an appropriate mix of debt and equity capital.